So many wonderful prizes are up for grabs for this year's GRAND PRIZE!!! And there you have it! $200 in glorious prizes to be won RIGHT HERE!!! 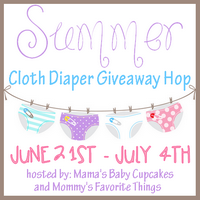 Mama's Baby Cupcakes, Mommy's Favorite Things and the "Summer Cloth Diaper" participating bloggers are not responsible for sponsors who do not fulfill prize obligations. The Buttons diapers, probably. I only have one cover, but I would love more! They have such cute prints now! Hard to choose between Buttons and Best Bottoms! I don't have Coral Reef or Under the Sea yet. I am excited about all the prizes for the grand prize . I guess I'm especially excited about the assortment of diapers to try. I've only used Best Bottoms and I like them so I'm excited to see others. I would be excited to win any prize, tbh. I would say I would be most excited to win the Buttons diapers, as I do not have any yet but have been hearing some great feedback on them! I would be most excited for the Best Bottom prize. A great giveaway! I haven't tried any of those diapers or inserts, would love to try them. I'm most excited to win the project Pomona pants or the buttons diapers. The Buttons Diapers would be amazing!! 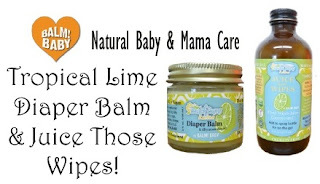 I love Balm Baby products too!! EEK! These are all terrific prizes! Would love to win any of them! The diapers and wet bag might be on the top of my wish list. 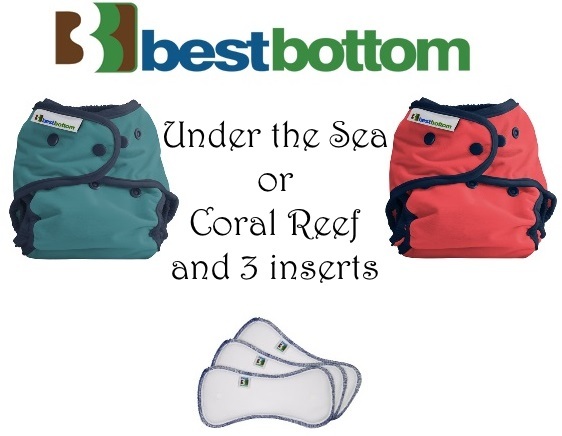 I am really excited about trying the Best Bottoms diapers! In love those Project Pomona shorts!! I love everything from them!! For sure most excited for the PP pair of choice!! I would love the Project Pomona shorts and the TidyTots Trial set. There are so many amazing prizes though! 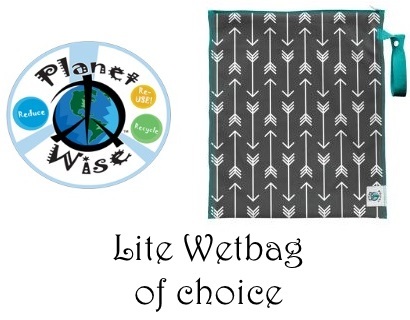 I would love the planet wise wet bag! I love each item! But I think the Balm Baby is high up there for me. Loving all the natural products right now! I would really like to try the Best Bottoms pack! Best bottoms are my favorite! I would love the tidy tots or project pomona. I would love any prize, really, but tidy tots looks really cute! Any diaper set or cover would be awesome to help us out! I would love the Buttons diapers. We are trying to build up our stash for our 2 littles (and possibly a 3rd!) in cloth so that prize would definitely help us the most. All of the prizes are awesome and we would love any of them so the choice was hard to make. :) Thanks for the giveaway hop! 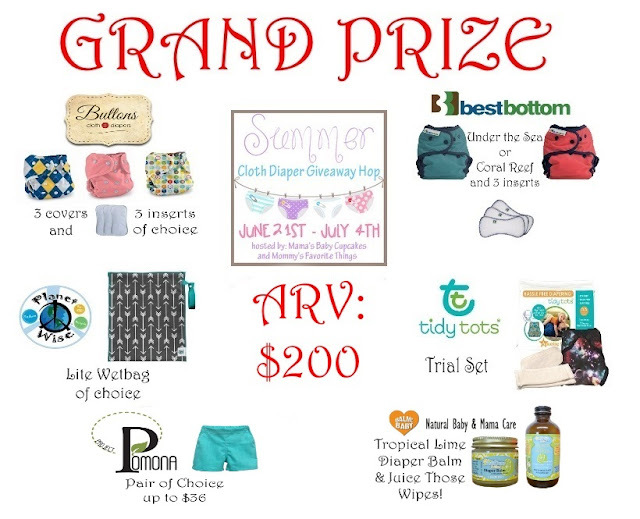 I'm the most excited for the buttons diapers, but all of the prizes look awesome! I think I'm most excited for the Buttons diapers! I've been wanting to try them for so long! Most excited for the Project Pomona's! All of these things are exciting - but I would love, love, love to try the pomona shorts!!! These are great prizes! The most coveted for me is the Buttons prize package to help build my stash! I'm excited about the large assortment of cloth diapers!! BALM! Baby sounds amazing love to try it out All the prizes look so great! I'd like to win the Best Bottom prize, it's the system we use. I would love to win the Button Cloth Diapers, such cute covers!!! I would love to try any of the cloth diapers. I came for the Best Bottoms, but all of these prizes are great! I know I've heard awesome things about Buttons and Project Pomona! I'd love to try all of the other stuff too! I would love to try out the diapers. I don't have any of the brands yet, so they would be great to add to my collection! I want to win the buttons diapers because I haven't tried them yet. I'd say the Buttons diapers...they are cute, and I don't have any! I'd love to try the Buttons AI2 diapers! I'd love to try the Buttons diapers! I'd love to try the buttons diapers. I've heard good things about them! I would love to win the buttons diaper pack, I want to try them. I'd love the Buttons package! I'd be so happy to win the Buttons! The Tidy Tots trial set would be great, I LOVE the galaxy print shown in the picture! I would love the Button diapers, or the Project Pomona pants! Thanks! I am most excited to hopefully win the Buttons!